The smash success of Five Nights At Freddy’s—a mobile game where you hide from murderous animatronics—was kind of a no-brainer when you consider that only the wide, innocent eyes of a child could look at a member of the Chuck E. Cheese house band without shitting themselves in fear. And it’s that reality that allows for videos such as these to exist. 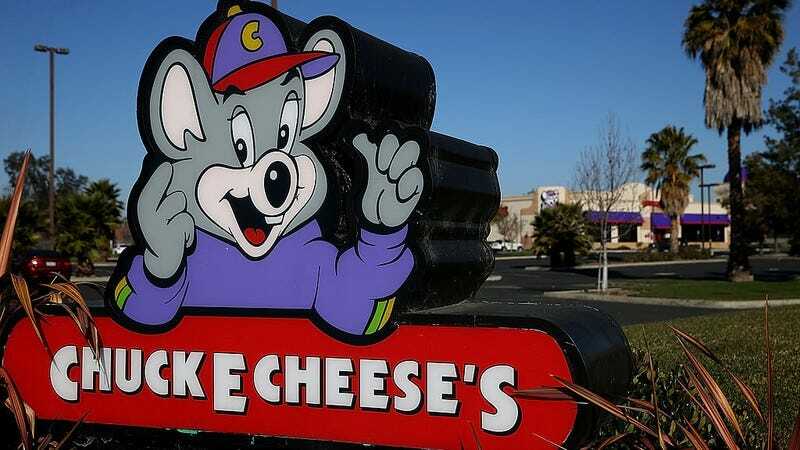 Below, you’ll find the “Top Ten Chuck E. Cheese Animatronic Malfunctions And Fails” (a title the narrator hilariously struggles to get through). Each clip succeeds at unnerving you into laughter, but the best ones transcend mere malfunction. For example, to watch Pasqually’s mustache fall off during a performance is to entertain the possibility that he’s been an undercover cop this whole time. And in the video’s first clip, Cheese stops dancing mid-lyric to close his eyes, smile, and presumably pray for forgiveness before hopping offstage to wreak havoc. The best, though? A child’s discernible scream as the animals lose control of their limbs mid-song. Who needs a Five Nights At Freddy’s movie?